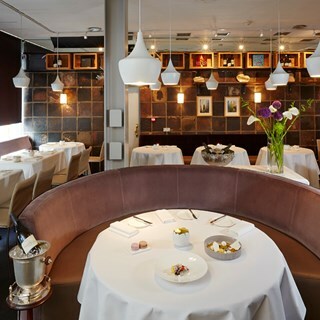 Ideally located on Dawson Street, Amuse is a bijoux 40-seater restaurant owned and run by a couple, Joanna & Conor Dempsey. Conor leads the kitchen to create his own modern French-Asian style cuisine, unique in style to anywhere else in the city. The ambience in the restaurant is warm and friendly, with a professional and discreet service. An interesting and delightful wine list to complement the menus. Tasting Menus are the most popular way to enjoy this special place in the heart of Dublin! Rather lovely, the food was original and the presentation very stylish. Only knocking a star off atmosphere as it was so quiet in terms of number of customers. Actually I think it has a really nice ambience. Stunning looking and delicious tasting food. Enjoyed every minute we were there. There are restaurants in the area with far more customers who don’t realise what they’re missing! Absolutely loved it! Stunning presentation of food and tastes worked so well, first time having fine dining with an Asian twist. Staff were great too, attentive and informative. A wonderful tradition of a pre-Christmas lunch with friends. The atmosphere in the dining room is perfect; busy but not overly crowded. A good ratio of waiters to patrons, attentive but not interruptive. The quality of the food was excellent, as was so the case on previous visits. The bill was steep but that was mostly due to our inability to forgo the temptation of some very good bottles, the food prices were most reasonable. Gorgeous food, the presentation was beautiful, cooked to perfection. Pieces of art. You could taste every element of the dish. Would definitely recommend. friendly staff that great food great value. being given an umbrella as i was leaving ,as not to get soaked in the lashing rain, topped it off. Because there are only 2 sittings, you're very limited in what times you can eat. As a result, the 12 o'clock sitting was dead which was a shame as it damaged the atmosphere. Maybe they should just allow bookings as people choose. Truly excellent food. Beautifully thought out cooked and delivered. Very imaginative and tasty meal. Amuse deserves a Michelin star. We had the tasting menu. Our waiter chose some excellent wines too. Couldn't have been better. I especially love the friendly atmosphere, since I find most fine dining restaurants a bit too formal. After 9 tasting courses, you’re so full but still want more! The food is deliciously fabulous. Devine food in a wonderful ambience. Staff are amazing too, very attentive but not in your face. We had an amazing night, went for a tasting menu and we were both speechless, the rich pallet of tastes made us go back to the childhood memories. Service was amazing not only friendly but also professional and it added a lot to overplay experience! We will definitely go back! The room is a bit underwhelming doesn’t match how good the food is. I went for lunch with colleagues and the food was delicious. I will definitely go again! Really like the place, the food and particularly the staff. Looking forward to the new menu, you should update your web site, that’s the only moan. Interesting menu with excellent flavors. Fantastic service and accessible wine list. Well worth a visit. Very nice lunch - well chosen wines to match the courses. Awesome food and service. We were very happy with our visit at the Amuse restaurant. Surprising food with an excellent service. A place to come back!